Dog Guard® indoor transmitters can be placed in areas of your home to create a hidden cat fence that prevents your cat or other furry friends from jumping onto countertops, getting into the garbage, sneaking out the door, or using your sofa as a claw sharpener! Cats are outdoor lovers too, and Dog Guard® has a cat fencing solution that will keep your cat safely contained in and around your home. Dog Guard® has developed proven training techniques designed specifically for your cat and other small pets. 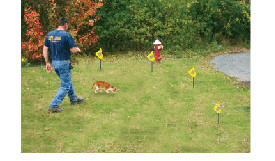 Training starts with a small area of your home, in order to familiarize your pet with some of the training equipment; this occurs before setting up restrictive cat containment zones in the house or moving on to outside training. Dog Guard® equipment features 32 levels of stimulation, so you can customize a stimulation level that best matches your pet’s temperament. Additionally, Dog Guard® containment collars are designed to accommodate all sizes of cats and dogs. All Dog Guard® equipment is made in the U.S. and comes with a lifetime warranty.